Looking for the most affordable 4G smartphone with dual powerful camera than great news for you, Intex has launched it’s 3rd 4G smartphone, the all new Intex Cloud 4G Star priced at Rs 7,299 in Black and Champagne colours options excursively through Flipkart. Intex has recently launched it’s 4G budget phone, Intex Aqua Trend at Rs 9,444. Intex Aqua 4G Plus priced at Rs 9,490. Intex has recently launched 3G budget smartphone, Intex Cloud Power+ at Rs 8,5999 and Intex Aqua power+ priced at Rs 8,999. The all new Intex Cloud 4G Star supports 4G LTE, dual-SIM (GSM+GSM), 3G, GPRS/ EDGE, Wi-Fi 802.11 b/g/n, Micro-USB, and Bluetooth offers you a a 5-inch HD display with resolution (720×1280 pixels) and colour depth RGB/16.7m promising crystal clear view from every angle while latest Android 5.0 Lollipop and powerful 1.3GHz Quad-core processor capable of revolutionizing your multitasking. Aqua Power’s 2GB RAM, 16GB ROM and 32GB external memory combines a 13-MP Primary camera with LED flash and 5-MP secondary front camera for video calling and selfie powered 2300mAh battery with Smart features – Fast Charging promising Talk Time up to 8 hrs and Standby Time 210 hours measures 140x71x9.45mm weight 136gm. while The all new Intex Aqua Trend offers you a 5-inch HD display with resolution (720×1280 pixels) and colour depth RGB/16.7m promising crystal clear view from every angle while latest Android 5.1 Lollipop and powerful 1.3GHz quad-core MediaTek (MT6735) processor wit 2GB RAM, 16GB ROM and 32GB offers you a 13-MP Primary camera with LED flash and 5-MP secondary front camera packed with a 3,000mAh battery with Smart features – Fast Charging promising Talk Time up to 20 hrs and Standby Time 1176 hours measures 144.5×72.5×8.9mm weight 152gm. It also supports 4GLTE, dual-SIM (GSM+GSM), 3G, GPRS/ EDGE, Wi-Fi 802.11 b/g/n, Micro-USB, and Bluetooth including HotKnot file transfer technology and 1-year screen breakage warranty. The all new Intex Aqua 4G Plus supports 4G LTE, dual-SIM (GSM+GSM), 3G, GPRS/ EDGE, Wi-Fi with hotspot functionality, Micro-USB, and Bluetooth offers you a a 5-inch HD display with resolution (720×1280 pixels) and colour depth RGB/16.7m runs on latest Android 5.0 Lollipop and powerful 1.3GHz Quad-core processor with 2GB RAM, 16GB ROM and 32GB external memory offers you a 13-MP Primary camera with LED flash and 5-MP secondary front camera for video calling and selfi packed with a 2300mAh battery with Smart features – Fast Charging promising Talk Time up to 7-8 Hours and Standby Time 280 hours measures 140X71X9.45mm and weight 136.5gm. 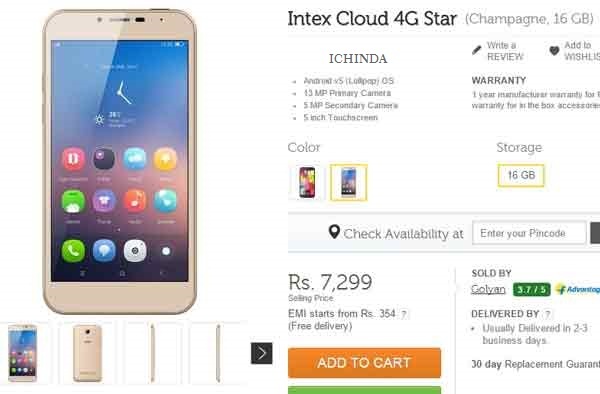 At last few honest word, Intex Cloud 4G Star is the best smartphone for Indians. What you think? Please be open to give your view.